Segmentation let you target your audience more specific. This way you can send your campaigns only to a certain user group. Mailster has several ways to choose the receivers of your next campaigns. Next to the very simple form of choosing lists you can define conditions which subscribers must match to get your newsletter. 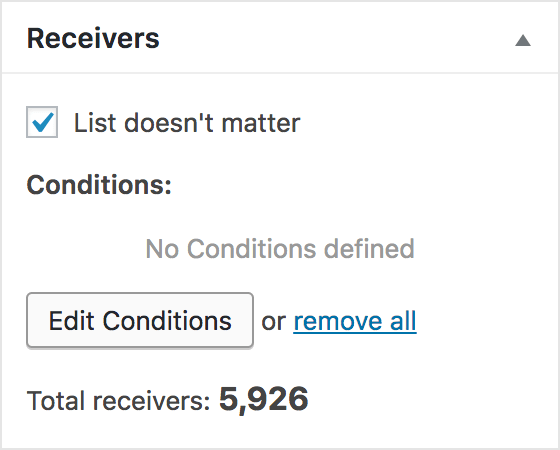 The most simple way to send only to a certain group is defining a list in your receivers meta box. This way you get your campaigns done in just a moment. Conditions are a more powerful way to target your audience. You have a variety of fields you can choose from. In the receivers meta box click on “Edit Conditions” to add or remove conditions for the receivers. This will reveal a popup with all your conditions. By default there’s no condition applied so all subscribers from the selected list will get the campaign. Add a new condition by clicking on the “Add Condition” button. This will add a new condition wich are based on three parts: Field, Operator and Value. This part describes which entity of subscribers meta data you like to check for. They are things like email, name, rating or custom fields or other meta data like signup date, referrer or WordPress user role. The Operator is the connection between the Field and the value. It’s something like “is” or “is not”, “contains” or contains not”, “starts with” and “ends with” as well some complex things with regular expressions. Based on the selected Field this can behave different. An “Email” can “end with” a certain “@domain.tld” for instance while a “Birthday” is “greater” than “1990-01-01” (which targets all birthdays after the 1st of January 1990). The Value represents the actual value of your condition. It’s a date for your date fields, a string for your name or a regular expression. Send campaigns only to subscribers with email ending with domain.tld. No John or Jane Doe will get your campaigns. Everyone with at least 70.1% user rating will get your campaign. Only your Editors which have a matching subscriber will get your campaign. Only people who were born after the 1st of January 1990 will get this campaigns. This requires to have a birthdate of your subscribers. There is a difference between AND connected conditions and OR connected ones. This OR connection targets all subscribers which have either “Joe” or “Jane” as first name which targets Ms. Jane Doe as well Mr. Joe Doe. This AND connection targets all subscribers with a first name of “Joe” and a last name of “Doe”. While there’s a match on Mr Joe Doe Mrs. Doe is not a receiver.